RA in a Half Day | What Are You Reading? This year’s successful RA in a Day event (yes, a full day this year!) was held today at Vancouver Public Library’s Central branch. The BCLA Readers’ Advisory Group extends thanks to those of you who joined us in person today, or who chimed in the conversation on Twitter (#RAinaDay). We also offer thanks to Library Bound for once again sponsoring the event. We’d also like to acknowledge that this year’s event took place on the ancestral, traditional and unceded Aboriginal territories of the Coast Salish Peoples. 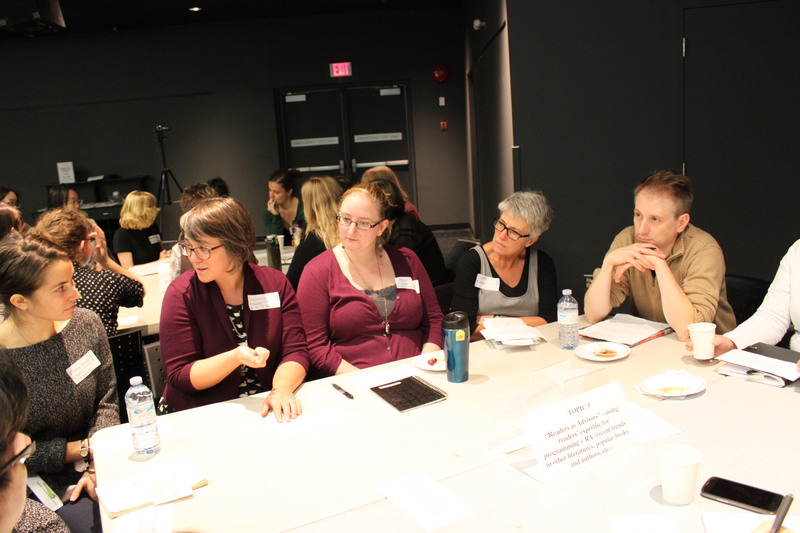 RA in a Day 2015 opened with a literacy workshop hosted by Joan Acosta, formerly of The Westcoast Reader and Diana Twiss of Decoda Literary Solutions. Diana began by reframing how we measure literacy, explaining it is not an on-off switch; instead, we should consider literacy as a spectrum of how well readers can read. Literacy and reading are learned skills that need to be practiced. Diana points out that reading consists of three cognitive processes: analyzing, interpreting, and monitoring. These are the skills and strategies that fluent readers often have. For instance, fluent readers are strategic and selective in their reading, and can make inferences, set goals, and monitor their comprehension. They often have background knowledge to assist them, and can summarize and reflect on their reading. Importantly, they expect to understand. Meanwhile, struggling readers often read the entire text start to finish, rather than skimming or scanning. They may have more limited vocabulary or struggle with decoding sentences. They may have trouble connecting ideas, or reflecting on what they’re reading. They often lack background knowledge, and may not read widely or often. It is important to remember that there are multiple and varied reasons for reading difficulty, including affects of aging, poor vision, physical or emotional stress, and learning disabilities, to name only a few. In the interactive workshop, Diana and Joan asked us to work in small groups to analyze some books to attempt to find a fit between reader and text. Elements of the text that we can consider in terms of literacy levels include: the number and complexity of sentences, the number of words per sentence, multi-syllable words, presence of abstract words or idioms, presence of visual cues and sight words, and layout and organization of the page. Additionally, a personal story or narrative can connect a reader to a text. It also helps us to know the reader’s familiarity with a topic, their background knowledge, their interest in the topic, reading skill levels, and comprehension strategies. Finding out some of these elements can help us match them with an appropriate text. Finally, don’t hesitate to ask readers direct questions about their reading levels and comprehension skills. While there can be stigmas associated to literacy levels, we should work towards trying to shed these attitudes as most readers are approaching librarians because they want our support and guidance. Coming up soon: reports on the inaugural BCLA RA in a Day BookSlam; our perennial favourite Speed Dating Through the Genres; and a keynote from Dr. Brenna Clarke Gray of Douglas College and Book Riot. This entry was posted in RA Events and Training, RA in a Day, RA in a Half Day and tagged adult literacy, Literacy Levels, RA in a Day, RA in a Half Day on October 21, 2015 by chloethelibrarian. This year the interactive section of RA in a Half Day was led by our guest speaker, Keren Dali who provided us an opportunity to share insights, develop conversations, and exchange ideas about serving immigrant and ESL readers. 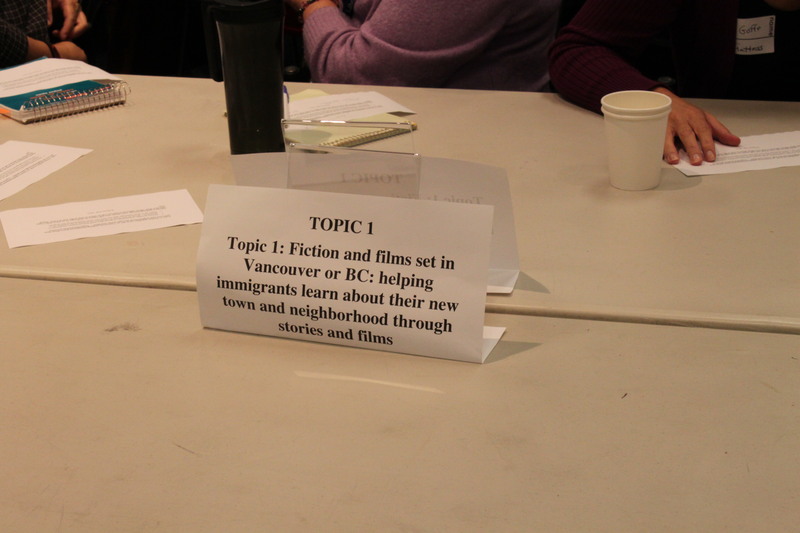 In discussing the use of fiction or films set locally, such as in Vancouver, the thought was that this would generate good integrated programming for newcomers, “old-timers” (immigrants already settled into the community), and native residents. Struggles included how to attract the mixed audience, how to evaluate it, and, in smaller communities, finding specific local materials. The suggestion when talking about inclusive and integrated book clubs was that you could encourage integration by building immigrant reader opportunities into an existing book club. Concerns included worries about choosing materials translated into enough different languages, who would select the titles, could the library have them available in all necessary languages, and how to promote it. Dali encouraged us to accept the idea that libraries will not always be the place where readers get their copy of the book. Discuss this issue with the book club members, because if you buy the book in many languages, many of those books will never again circulate after the book club is finished with them. In discussing the solicitation of feedback from immigrant groups including operating multilingual advisory groups, it was easy to list numerous advantages. A multilingual advisory group could crowd source local expertise in literature from various languages, helps the library develop a clearer picture of the need of these readers, mitigates the lack of formal research available on the subject of immigrant and ESL reader communities, and increases awareness of the collections and services libraries offer while building comfort and agency in that section of the community. There were definite concerns over having some local language communities or certain individuals dominate the conversation, a concern that Dali actually stressed on several occasions in her talk. In addition there were concerns about the level of understanding and expertise that the community had in using library tools like BiblioCommons or even in how to analyse the qualities of and recommend reading material. In thinking about specific ESL communities that our libraries serve, the issue of having staff who speak the language of the immigrant communities was a major theme. Some libraries were struggling to serve smaller foreign language communities when they have a huge dominant foreign language community they have already identified and designed significant services for. 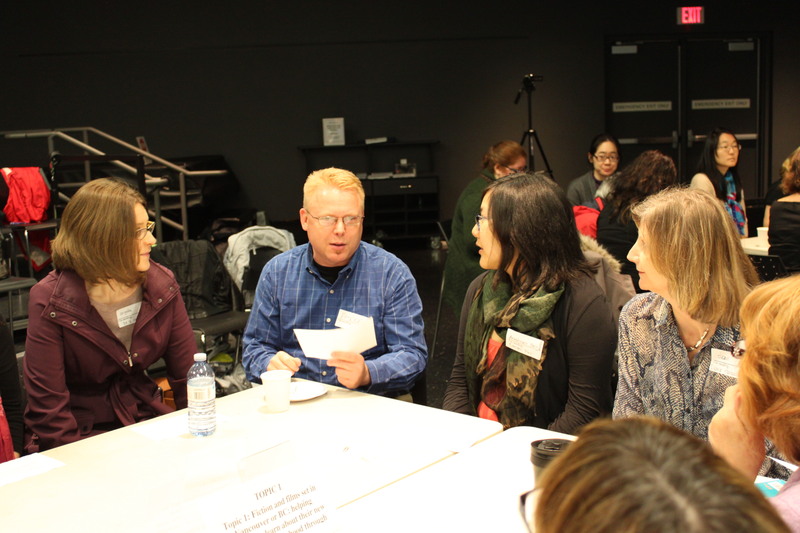 A big part of the discussion revolved around how to break into these smaller language groups. Additional concerns revolved around how to assess the literacy level of various local language communities in their own native tongues so that our multilingual collections are representative of their reading level needs. A discussion on multilingual collections including selection, management, and marketing them included some useful suggestions including building community partnership programs, employing pop-up surveys on the website and in house, contacting local adult education programs, and advertising to immigrant families via story time. Concerns included finding a good source for materials purchases, managing the scope including both your staffing and monetary resources, figuring out how to make the contacts, and dealing with a significant lack of knowledge in our communities generally (but yes in immigrant communities especially) about what is offered at libraries. They really encourage perseverance in connecting with these communities and educating them on library collections and services, a point that Dali re-enforced as being critical. Keep talking about your libraries programs and collections and keep working to build trust in with community. A big thanks to the wonderful RA in a Half Day participants who shared some great conversations and ideas! This entry was posted in Community, Multilingual Collections, RA Events and Training, RA in a Half Day and tagged ESL Readers' Advisory, Multilingual Collections, RA in a Half Day on October 21, 2014 by annaferri. Another exciting RA in a Half Day from the BCLA Readers’ Advisory Interest Group kicked off in the Richmond Cultural Centre with on opening welcome from Theresa de Sousa, Librarian at Richmond Public Library. Again this year, BCLA Readers’ Advisory Interest would like to thank Library Bound for sponsoring the event. Barbara Edwards, Community Relations Librarian at Vancouver Public Library introduced the first speaker of the day, Keren Dali, a researcher who studies the reading experiences of immigrants. Chock full of practical ideas and positive messages, Dali offered a wonderful amount of insight into how immigrants pursue and think about reading for leisure. She emphasized the interest of immigrant readers in reading in English, genre fiction, and not the obvious “easy reader” materials. However, they often do not understand how the North American publishing industry works (assuming, for instance, that hardbacks are unabridged and paperbacks are abridged), nor have experience in the vast array of genres that we have in the English literature tradition. They need guidance in understanding the landscape of English language reading materials from how the publishing industry and libraries work to the basics of genre designations and the big name authors in these genres. Find out what is popular in literature in their native language and help them translate that appeal into the appeal of various English language literature genres. Communicating with people new to your own native language will produce interaction fatigue (repeating yourself, consciously simplifying your language, slowing your speech, making them repeat themselves). This is natural, reduces with practice, but can inspire anxiety and cause us to try to shorten these transactions or make us abrupt. Warmth, interest, and positivity in are critical in the Readers Advisory transactions as part of these inter-cultural interactions that are building their comfort and proficiency in Canadian society. Dali suggests that we often think of immigrant readers in our libraries as “newcomers” but many are actually “old-timers” who have been in the country a few years and are already adjusting to the culture. They are ready to move beyond materials on the immigrant experience, easy reader materials, and they want to move away from being served as readers with special needs. Above all, she encourages us to “ASK YOUR READERS!” Develop these conversations actively and via workshops, mixed ESL book groups, and immigrant advisory groups so that we are building relationships in this community and helping this population to develop comfort and build connections here. Next up, Keren Dali will be leading us in an interactive activity on immigrant Readers Advisory services. This entry was posted in Multilingual Collections, RA Events and Training, RA in a Half Day and tagged ESL Readers' Advisory, Keren Dali, Multilingual Collections, RA in a Half Day on October 20, 2014 by annaferri. Description of Genre: From Wikipedia: Self-help, or self-improvement, is a self-guided improvement—economically, intellectually, or emotionally—often with a substantial psychological basis. Many different self-help groups exist and each has its own focus, techniques, associated beliefs, proponents and in some cases, leaders. Alcoholics Anonymous, probably the best known self-help culture has given us new language: recovery, dysfunctional families, and codependency. Self-help is about getting information, finding a support group, maybe on the Internet or in person, where people in similar situations join together. Potential benefits of self-help groups include friendship, emotional support, experiential knowledge, identity, meaningful roles, and a sense of belonging. “I read it and it didn’t work” – there is no magic, you have to make it work. Tailored guidance: does the author offer advice that is special to the targeted audience? Accuracy: does the author offer advice that is accurate, ethical, feasible and appropriate? Does the advice conform to established norms in the field? Self-help is the development of your potential, including beliefs, goal setting, learning new habits, making positive changes re: your mental attitude and your ideas. We live in a state of constant learning for new skills and habits. We need to have a healthy dose of realism: if it sounds too good to be true, it is. The most successful people seek new knowledge, internalize it and turn what they know into effective action. You often need someone else to tell you what you already know because it reinforces the ideas and the message, which helps you internalize it. Taking action doesn’t guarantee success but it boosts the odds. There are not necessarily clear-cut answers or solutions to certain issues – at best, you learn you aren’t alone, that you can live with it and look forward despite reality. Does it seem too simple to be true? Does it seem like just commonsense? It will nonetheless require motivation and discipline to achieve. A great deal of effort has gone into making it easily communicated and understood. Yes, there are scams, as there are everywhere. The dirty little secret of Self-Help: everything works….for a while (placebo effect). Just by intervening in the current situation or the status quo by focusing your attention, consciously paying attention will get some results. The value lies in actually doing it, taking the advice, and making changes. The most important thing: get started. One book isn’t enough, use several. Beware the quick fix – the quick fix may is rarely sustainable. Jump-start your system. Use your commonsense and be open to discovering new things. Action produces initial changes. Habits produce permanent changes. When we are drowning in information, we benefit greatly from someone who can provide succinct key ideas in a structured and organized manner. Structure brings better results than willpower. Great ideas are not necessarily new ideas. Focus on the message, not the messenger. Good self-help asks you a set of questions which leads to a diagnosis of your present situation and then sends you down the right course of action. Life: your biggest DIY project. This entry was posted in Genres, RA Events and Training, RA in a Half Day, RA Tools and tagged 2013, Genre, Jenny Fry, RA in a Half Day, Self Help, Speed Dating Through the Genres, Surrey Libraries, Vancouver Public Library on December 23, 2013 by nvcllibrarian.